The Accounting Process is a sequence of organization activities that is used for gaining quantitative information about the finances. This complex process consists of a set of sequential steps. 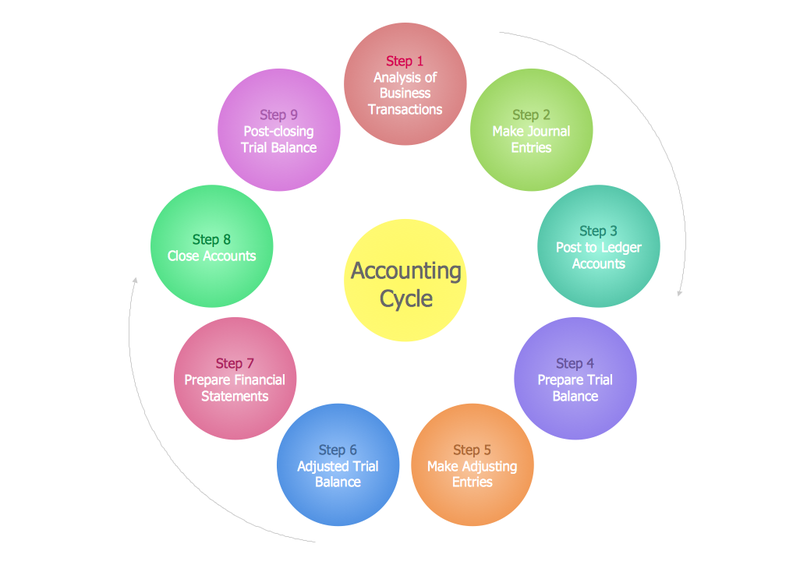 This diagram was created in ConceptDraw DIAGRAM and illustrates the steps in the accounting process. ConceptDraw DIAGRAM extended with Accounting Flowcharts Solution will help you facilitate your accounting process. Accounting Flowcharts Solution contains the useful and convenient tools for easily drawing the Accounting Flowcharts. Designing the accounting flowcharts with complex steps in the accounting process, you can use the useful technique – replace some details in a separate flowchart. This sample was created in ConceptDraw DIAGRAM using the Accounting Flowcharts library from the Accounting Flowcharts Solution and shows the accounting flowchart of the procurement process mapping. An experienced user spent 10 minutes creating this sample. Use the ConceptDraw DIAGRAM with Accounting Flowcharts Solution to show the steps in the accounting process, the steps of accounting cycle and to create your own professional looking Accounting Flowcharts of any complexity quick and easy.